2.0" x 2.1" stitched on 14 count. 1.6" x 1.6" stitched on 18 count. Patriotic Trio cross stitch pattern... 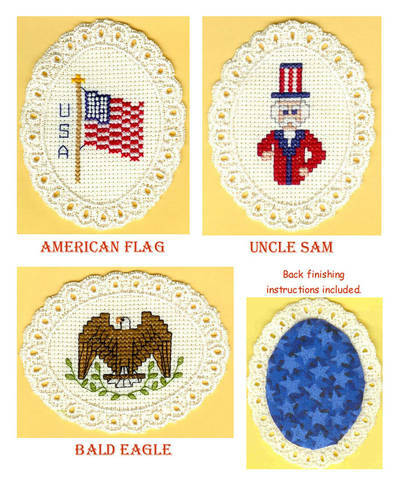 These 3 American patriotic designs may each be put on pre-finished ovals ready to thread ribbon through the lace edge and hang for patriotic decorations, used on fabric, or used with waste canvas. A few partial stitches are used.